Heroes of the sword live by the sword and they die by the sword. Unless you can upgrade, train and control their destinies with cunning, luck, skill and a lot of slashing. 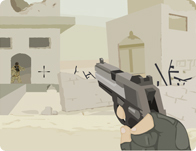 Use the mouse to shoot! Guns, bombs, lasers, missles, shotguns EVERYTHING! Upgrade your character with every type of weapon you can and unlock the entirety of this giant platform campaign! Never e nding shooting with tons of upgrades, characters to play and baddies to kill. Be a kitty or a pirate take on the whole forest yourself with tons of fast firing weapons. Fort Blaster - Ahoy There!